Villars is located in the Vaud Alps, Switzerland, at approximately 1300m altitude. You can find timetables and purchase tickets in advance on the SBB site. Note that Swiss train ticket pricing is eminently sensible, you will pay the same price no matter when you buy the ticket or what time of day you take the train. The bus timetable can be found here. If you're not travelling by car this is the easiest route. Geneva Airport train station is located at the end of the arrivals area (head left after the arrivals gate then to the end of the airport). You can purchase tickets in the airport at baggage reclaim, or in the train station. 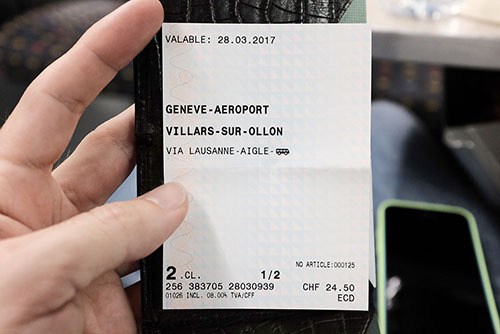 You will need to purchase a ticket for Villars-sur-Ollon, via Lausanne & Aigle. Choose 2e classe sans reduction. The total cost without reduction should be just under 50 CHF (picture 01, I have a half pass hence 24.50). 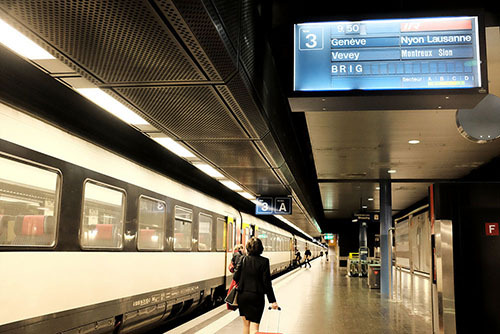 The train leaves from platform 3 and is the InterRegio Direction: Brig (picture 02). You are aiming to get off at Aigle. Note that the signs rarely say Aigle and the train driver may not announce this as a stop until half way through your journey, but the train will stop there. The train takes approximately 50 mins to get to Lausanne, and then another 30 minutes to get to Aigle. 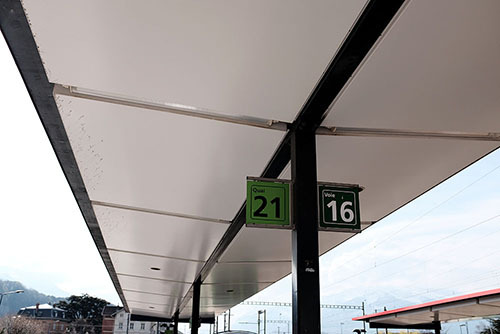 When you arrive at Aigle exit the train station you will see the bus stops on your right, you want to be at stop 21 (picture 03). The bus to Villars-sur-Ollon leaves at 5 to the hour every hour between 05:55 and 18:55. There is then one final bus at 20:55. The bus ride takes about 30 mins. Note the last bus from Aigle being at 20:55 - this means the last train you can get from Geneva Airport to catch this bus leaves at 19:20. If you manage to miss this due to a late or delayed flight or just bad timing, then give Lee a call (send us an email to get his number) and he will come and pick you up. This is pretty much the same as above, except you stay on the train and get off at the next station, Bex instead of Aigle. You then get the Regio to Villars-sur-Ollon. There is no real advantage to doing this as it takes a little bit longer and doesn't run any later than the last bus. If you are more than one then this might be a good idea as it will save you on the cost of train + bus tickets. The ideal way to do this is to go into the French sector in Geneva airport, as this is significantly cheaper than renting a car in the Swiss side of the airport. To do so head to departures on the first floor then towards the end of the airport, to your right after you ascend, you can then go into the French sector and car hire desks can be found there. From Zurich the total journey time is about 4 hours, meaning the absolute latest you want to be leaving Zurich Airport is about 17:40 to avoid missing the last bus to Villars. As above, if you do miss the last bus then give Lee a call. Note that the autoroutes in Switzerland require an annual pass (vignette). This costs 40 CHF and is valid until the end of the next January.